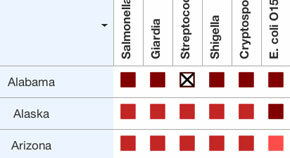 INTERACTIVE DATABASE: The CDC wants each state to track 20 categories of foodborne illness. Check how your state responds. Cholera bacteria, TEM: Copyright Photo Researchers Inc.
Clostridium bacteria (botulism): Copyright Photo Researchers Inc. Colony of Brucella sp. bacteria: Copyright Photo Researchers Inc.
E. coli bacteria, SEM (Non-O157 STEC): Copyright Photo Researchers Inc. Hepatitis A viruses: Copyright Photo Researchers Inc.
LM of Trichinella in muscle: Copyright Photo Researchers Inc.
Mycobacterium bovis, TEM: Copyright Photo Researchers Inc.
Salmonella enteritidis bacterium: Copyright Photo Researchers Inc.
Salmonella typhimurium, TEM: Copyright Photo Researchers Inc.
Streptococcus pneumoniae bacteria: Copyright Photo Researchers Inc.
Vibrio cholerae bacterium (cholera): Copyright Photo Researchers Inc.